The 2018 Angel Ornaments - a recognition and remembrance project of Mount Evans Home Health Care and Hospice are now available. This year we had 75 Volunteer Angel Makers joins us to make the collectible angels. It's a longstanding tradition at Mount Evans. Some of our volunteers have been with us for 25 years crafting the celestial messengers. The 2018 Mount Evans Angel wears a feathered halo above her long, braided hair. Please consider giving her a place in your home for the holidays. If you'd like to dedicate your Mount Evans Angel to a loved one, we'd be honored to enter their name into our 2018 Book of Angels. 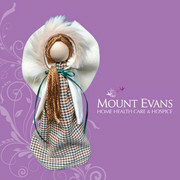 Angels are given in exchange for $25 donation to Mount Evans. You can call 303-674-6400 to place your order over the phone or you can order online at http://www.mountevans.org. You are also welcome to drop in at Mount Evans Home Health Care & Hospice (3081 Bergen Peak Drive) to pick one up. By remembering the angels in your life, you will help the team at Mount Evans provide comfort and expert medical care to mountain-area patients and their families.